Stanton seems to be positively knocking books out at the moment. I have enjoyed all his books so far, and this one is possibly his greatest to date. Stanton is at his best when public speaking on the subject of UFOs. As a scientist himself, he is able to explode many of the myths about the subject, which have been built up over the years by debunkers. His exploration of the actual evidence is compelling. His decimation of the debunkers is, additionally, a great morale boost for Ufologists. 'Flying Saucers and Science' is, essentially, a written version of his lecture 'Flying Saucers ARE Real', which Stanton has given to over 700 college and professional audiences. 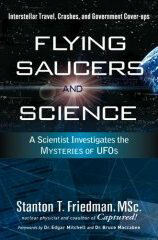 But where the lecture is necessarily constrained to one and an half hours, this book allows Stanton to tackle some of the misconceptions about the evidence for UFOs in more detail. He could easily have gone over the ground of many books of this genre - namely, to present an in-depth look at various famous cases. Instead, he concentrates on the negative counter-arguments presented by debunkers, particularly those from a science background. This is where the real battle lies, he argues. The evidence is there for anyone who cares to look with unprejudiced eyes. The problem with Ufology is that it has been fighting a rearguard action for decades, against a campaign of spin, ridicule and ignorance. Stanton takes that attack head-on, and fights back. The result is a glorious book, full of hard-hitting facts and statistics. This author is not afraid to have the courage of his convictions, and to stare down his accusers. In fact, he goes further. He shows how eminent sceptics from science, science fiction and academia have been peddling lies for decades. They are either ignorant of the facts, or they simply aren't interested in attending to the evidence in front of them. Instead, they dismiss the entire subject publicly, depending upon their own reputations to ground their negative opinions in the mind of the public. Within the media, this sceptical approach has been successful, generally. Yet, such a widespread victory of opinion over fact has not been reflected in actual opinion polls. Stanton shows how the people have not succumbed to the relentless bombardment of negativity. Perhaps this is because people can see how plausible it is that we would have been visited. So many of us know someone who has had a remarkable UFO story to tell. The urgency of the everyday encounter with the unknown outweighs the opinion of so-called experts, whose knowledge of the actual subject is often found wanting. Stanton not only debunks the debunkers. He also presents the aspects of scientific progress that support the possibility of alien visitation to our planet. He shows how travel to systems light years away is eminently plausible, using nuclear fusion or fission rockets. He marvels at how scientists struggle with the simplicity of this approach to interstellar travel. He questions why SETI (which he calls a 'cult') would rather assume that aliens must live 1000 light years away, than in our celestial backyard. It suits their purposes to argue that visitation is impossible, when it quite clearly holds great potential. Furthermore, Stanton provides clear evidence for a widespread cover-up regarding the subject of UFOs. He recalls the successful surfacing of largely blacked-out (and, more recently, whited-out) documents from various intelligence agencies, following FOIA requests. Their prior denials of the existence of such documents are dragged through the mud. There is clearly a case to answer here about governmental obfuscation. I had just one problem with this book. The penultimate chapter on the Majestic 12 documents assumed way too much prior knowledge of the subject (and, bear in mind, I have already read Stanton's previous book on the subject!). I really struggled to stay awake through some of the more intricate details presented here. I accept that it is important to make the case as to why some of Stanton's detractors are misinformed. But, after a while this particular jumble began to appear like a personal crusade, leaving the reader by the wayside. The chapter would have been better presented as a shorter essay with an appendix pertaining to the grittier detail. So, in conclusion, this is a morale-lifting book in which Stanton takes his critics to pieces, and shows convincingly why Ufology is based upon a firm foundation of evidence. Read it, and enjoy! Subtitled: "A Scientist Investigates the Mysteries of UFOs"